” … this book … is not an inspirational romance. It is a regular contemporary romance that features characters who happen to be religious … Spirituality is an important aspect of human experience and the lives of a lot of people, but it’s often surprisingly absent from contemporary romances … the point of this story is not to present any sort of religious message, but faith is important to these characters, and so the plot and character development turns on their spiritual condition.” Says Adams in the forward to A Baby For Easter. Miss Bates was fascinated by her distinction and remains fascinated by any treatment of religion in romance, especially if it’s not contained in the obvious, i.e., the inspirational sub-genre. She was also keen to read Adams when she read Ros’s interview with her here. Miss Bates’s opinion of the novel is two-fold, how the religious theme was treated and how it held up as a romance: the former was refreshing, appealing, and interesting, and the latter, uneven. Miss Bates agrees with Adams when she says that religious content should come naturally to the romance novel because religion, or the questioning of religion, or the rejection of it, are ideas that many people consider at some, or many times in their lives. It doesn’t have to be in every romance, but it also doesn’t have to be so strangely absent from it either. It is an aspect that offers one more opportunity to enrich character and deepen narrative; or not, depending on the treatment and writing. It does so in A Baby For Easter, so much so that the romance pales in comparison. Miss Bates enjoyed Adams’s novel and would recommend it with caveats; as Adams herself says in her forward, “there’s likely to be too much religion for some readers and too little for others.” In Miss B.’s estimation, the religious component was “just right” for her taste and sensibility. What the novel gained in that richness, it lost in the romance. The narrative giveth with one hand and the narrative taken away with another. “She thought about it as resurrecting her life, since Easter was only a few weeks away. 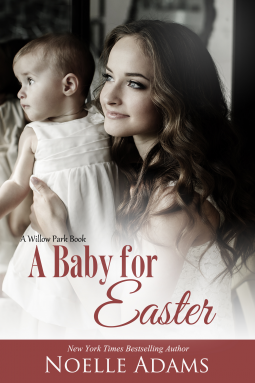 She’d always loved Easter with its promise of hope, healing, and new life … “ We meet Alice Grantham when she’s returned to Willow Park, N. Carolina, laid off from her job as a college librarian and with two failed engagements behind her. She lives with her parents, holding two part-time jobs, one as the pastor’s, Daniel’s, secretary and the other as librarian in the local public library. Her heart and confidence have taken beatings. Alice is not vain: her loss of confidence doesn’t stem from what she looks like, or what she did or didn’t do in her now-broken engagements. It stems from her loss of confidence in her ability to judge what’s right for her. Micah, the pastor’s unsmiling younger brother, with whom she’d spent one halcyon summer at eighteen, and his standoffish-ness every time he sees her now … well, it doesn’t do much to boost her confidence. Because Alice carries a torch. But Alice isn’t a whiner, or helpless ninny. She’s soft-spoken, self-deprecating, and ready to rebuild her life and be happy with whatever she has at hand. What Miss Bates loved about her was that she wasn’t stoic. She was cautious, thoughtful, but hopeful and loving too. As quoted above, she used Easter and the triumph of the Resurrection as a building metaphor for her life: it’s fitting and right. It’s what God wants for us; though Ms Adams states that her novel doesn’t carry any overt Christian message, this is a religious metaphor, a most appealing Christian one. It’s just not of the proselytizing, evangelical variety contained in inspirational romance. “He was still standing there, by himself in the otherwise empty church parking lot, tall and strong and handsome, and somehow lonely.” This is the hero, Micah, as Alice sees him. Alice’s perspective is the only one we’re privy to in A Baby For Easter. Adams is no master-stylist-Betty-Neels in terms of singular POV, but it didn’t interfere with Miss Bates’s enjoyment. Micah, like a Betty Neels hero, is a cipher. We never know what’s going on in his head. Certainly not for the first half of the novel as he plays silent and distant to Alice’s effusiveness. They meet often because of their connection to Daniel, but their shared past stands sentinel between them. Truth be told, Miss Bates found the first third and a bit of this short novel disappointing. The set-up took a while and, frankly, the narrative was flat: it took too long to get to know the characters. However, once Baby Cara appears (the result of Micah’s dissipated youth and a one-night-stand). Micah, at his wit’s end with a five-month old, asks Alice to act as nanny. Once Alice accepts, well, things start to simmer quite nicely. Part of that also comes when Adams gives Micah a voice. Micah’s voice, as he opens up to Alice, is an interesting one. Micah identifies as a sinner: he doesn’t beat himself up over what he’s done, but he feels “broken,” flawed, a failure. Miss Bates found this “broken-ness” theme compelling. It contained the role that religious conviction plays in healing “broken-ness.” Micah’s remoteness conceals a man unsure of whether he can ever do right and one who questions whether he deserves love and loyalty; as he says to Alice during one of their relationship’s darkest moments, ” ‘I was thinking about you. I just … made a mess of this whole thing, but I should have done better by you.’ ” Contrite and helpless, that’s Micah. What Miss Bates found interesting about the passage is the idea that we remake ourselves in tandem with God. If we keep the message of the Resurrection in our hearts, then the “old Alice” is “taken care of.” We are not alone, nor do we act alone, but we are, at the same time, free to choose to remake ourselves. We accept love as we do a gift and there are no deserving, or undeserving, it is there for the taking. What Micah has to learn to do is to see himself as a gift too, something good that he can offer Cara and Alice, because the “old Micah,” he’s “taken care of.” Micah learns that he doesn’t have to carry the “old Micah” as a cross so heavy he cannot have a life beyond one of endurance and repentance, just as Alice doesn’t have to carry her past naïveté and passivity. Is Alice such a paragon that she has nothing to learn? Alice, in Miss Bates’s interpretation, has to learn to read the world around her as her “resurrected” self. What she didn’t do with her previous two fiancés is that: she didn’t read the signs of what was already incipiently wrong with their relationships. It’s not about assigning blame; it’s about reading people and situations for what will and will not work. She starts out by doing the same with Micah: she reads his diffidence as indifference instead of humility. She must recognize that when she extricated herself from her broken relationships, she learned to read signs, indicators that can help her make the right decisions and choices. She did it; she only has to recognize it now. Because this is a romance, yay!, there are signs in the form of Micah’s gifts, starting with that most humble and decadent Easter treat, “… a box of chocolate cream-filled Easter eggs. He handed them to her, his expression diffident.” Alice is not stupid; she’s despondent. She too opens up to Micah when she says, ” ‘ … sometimes it feels like the world is taunting me with … a basket of beautiful flowers, making me think they could be mine. But then, when I reach out for them, all I get is a broken dandelion.’ ” A few days later, he arrives with “pink tulips” amongst the groceries. She doesn’t even realize they’re for her. Until she does, all she sees are dandelions. The best moment of the novel is when Micah offers her “an enormous basket filled with flowers – tulips and roses and lilies and orchids and daisies” and she doesn’t have to think twice to realize they’re for her … everything is, the beautiful baby and beautiful now-whole man and flowers. And because it’s what makes the romance genre so wonderful at times, in the end, she gets the words too. It started out slow and Miss Bates had her doubts about style and POV, but the resurrection of this novel in the last half made sure the the first half was “taken care of.” In Noelle Adams’s A Baby For Easter, Miss Bates found, “a mind lively and at ease,” Emma. Noelle Adams’s A Baby For Easter has been available, as a self-published title, in paper and e-format, since April 7th, at the usual vendors. Miss Bates is grateful to the author, for an e-ARC, via Netgalley, in exchange for this honest review. What thoughts do you have, dear reader, about the treatment of religious belief and practice in the romance genre, especially outside of inspirational romance? I think a character’s faith can add so much richness and depth to any story when that faith/belief isn’t turned into something resembling a hammer to pound on a poor reader’s head. I haven’t read many “inspirational” romances because the few I picked up were disappointing. Instead I’ve tried to find mainstream romances in which faith is an integral part of a character, like Christy Morrell in a Patricia Gaffney’s TO LOVE AND TO CHERISH. Christy is such a wonderful hero, optimistic, honorable, and yet he struggles, too, with his faith, and that aspect of his character, to me, is more riveting than a dozen debauched rakes’ stories. And then there’s one of my favorites: Laura Kinsale’s FLOWERS FROM THE STORM with Christian Langland, Duke of Jerveaux and Maddy Timms. That aspect, the “questioning”, is what I find most engaging in these types of books, and the ones I’ve mentioned here all share that element to varying degrees. I’m beginning to see a pattern developing. ;-). One other is Penelope Williamson’s THE OUTSIDER. Both the “questioning” and a “rejection” of religion, or faith generally, was a very powerful story and Rachel’s faith and Cain’s lack of faith added so much to their romance. Rachel’s faith was not only the way she and Johnny Cain were brought together, but also the consequences of her “Good Samaritan” act provide the vehicle for “Plain Rachel” to question and wrestle with some tenets of being one of the Plain People in a more concrete, realistic, satisfying manner. Rachel’s example as a person of faith is also a catalyst for Cain to finally discover something/someone to believe in. This book resonated with me, I think, for many reasons. I found Plain Rachel’s struggle to reconcile “black and white” with all those “gray” areas that confront her by taking in an “outsider” (one whose faith was other than that of the Plain People or one who had no faith at all, like Cain) to be powerfully genuine and honest. Rachel has questioned or struggled to reconcile some of the rather rigid rules of the “Plain people ” in the past, but her ensuing relationship with Cain really brings her shadowy, half-formed questions into the light. Her efforts to accept and understand and resolve those questions struck an answering chord in me. I hope the (sometimes) daily battle to seek answers to our questions or doubts regarding religious beliefs keeps faith strong and healthy, and I think it’s as important as saying “I believe.” It doesn’t mean rejection of faith or failure; it’s more actively engaging in trying to be a better person of faith and a vehicle for spiritual growth. This is what Plain Rachel is/does in “The Outsider.” Her faith is just as strong, if not stronger, by the end as it was in the beginning, despite her doubts and issues. I found the way she grappled with those things that troubled her credible and relatable. After all is said and done, she is still “Plain” Rachel Yoder. Likewise, Cain, who believes in nothing in the beginning, isn’t magically transformed by the end of the book. There’s only one small section of the book in Cain’s POV, and I think this is, in part, because Cain is the “outsider” so his thoughts are hidden. It’s such an heart-rending,despair-filled few little paragraphs, but it’s full of remorse, too. Another character remarks that Johnny Cain looks like someone who had “passed through to the other side of hell, to a place where the sun had burned to ash, and he had been left screaming in the darkness.” After his dark night of the soul, there is a small fragile seed of hope in his eyes not present before. Rachel thinks Johnny “needed to believe, and that maybe that was all faith really was (…). Simply a need to believe.” Though he does not become one of the “Plain” for her, he admits that what he’s learned of love, she taught him. “I don’t believe in anything, but I believe in you”, he says. It’a start anyway. Cain’s faith may be as small as a mustard seed, but I closed the book thinking that for Cain, at this point, all things ARE possible. I liked that hope-filled message. Miss Bates so agrees with you when you say that the “questioning” of faith makes for such an interesting element to a romance novel, in particular. Romance, by definition, is like faith, a leap into the belief in an HEA, so they have a lot in common. The hammer, as many inspirational romance, tend to wield, does not help their cause. Nevertheless, Miss Bates has learned to never say never in romance: because the most unappealing elements in the hands of a skilled writer can and do work. Christy is, for Miss Bates too, an ideal hero, really, he’s up there with Atticus Finch and reason for it, in her estimation, is because of his humility, his rueful humour, his spiritual struggles, and … oh, yes, because it is a romance, his love for the heroine, without crushing her, or manipulating her, or pressuring her. Penelope Williamson is an author that Miss Bates has always wanted to read, especially because she comes so highly recommended by Wendy Superlibrarian. WendySL hasn’t recommended a book that Miss B. hasn’t loved, except for the erotica (and that’s because Miss B. doesn’t read erotica). As for recommendations that are strictly inspirational, Miss B. quite enjoyed Elizabeth Camden (very light on the inspirational); one of her favourite romances (also recommended by Dear Author) is Allie Pleiter’s Homefront Hero. She’s also quite enjoyed Amanda Flower‘s Amish set cozy mysteries, especially because the romantic interest, a “fallen” Amish hero struggles with his estrangement from his community. You may also like to try Cindy Holby’s Angel’s End, which, like Adams’s book is not inspirational, but definitely has characters who struggle with their faith. The hero’s dilemma is especially interesting, as he takes on the town’s minister’s identity to escape certain repercussions, but ends up believing through the part he is playing. Sorry about the convoluted description, but Miss B. was trying to avoid spoilers. I have really enjoyed Adams’ books, and would recommend Married for Christmas to you. It also incorporates religion into the narrative, but avoids the God-THUNK-God-THUNK-God mentality of so much inspirational romance. I also thought it a better, more tightly written book than A Baby for Easter. In the traditional inspirational category, I like Beth Wiseman’s books as less in-your-face than many other inspirationals. If I ponder it for a while, I could come up with some historicals that involve religion in a gentle way (Balogh’s A Promise of Spring comes to mind). But I do agree that this is a lack in a lot of romance, a somewhat bizarre hollow at the core of what wants to relate to our realistic relationships. Miss B. quite enjoyed, yes!, the non-thunk-thunk nature of Adams’s writing in A Baby For Easter and will most definitely read Married For Christmas at your recommendation. 🙂 Her favourite non-thunky portrayal of faith is in Gaffney’s To Have and To Hold. Her hero, a man of the cloth, is full of doubt, but is so lovingly pastoral and cares so much about what he does and how he does it, a real and true shepherd. The romance is divine, BTW, (sorry ’bout the pun). It IS a hollow, though Miss Bates sees some growth in books like Adams’s. And welcomes it, of course. Yes, To Have and to Hold is one of Gaffney’s best. I would also recommend Wild Indigo by Judith Stanton. The characters are Moravian, and once upon a time Moravians determined who you married by drawing lots (yes, really). Very interesting read about a focused, religious lifestyle that is decidedly not an inspirational romance. Oh, thank you for the recommendation, Miss Bates found the novel on Amazon. It sounds fascinating … 🙂 There is, of course, all Kinsale’s great portrayal of the Quaker Maddie Girl in Flowers From the Storm.